This week, Disney/Pixar sends 2003’s Finding Nemo back into theaters in 3D; it also marks the end of a special weeklong run of 1981’s Raiders of the Lost Ark in some IMAX theaters. In the past few years we’ve seen multiple animated films converted to 3D (Toy Story and Toy Story 2, The Lion King), as well as Titanic in IMAX 3D and the first of a planned 3D re-release of all the Star Wars films. They were, each in their own way, classics in their original form. So, why re-release them? And we all intuitively know that the answer — since it’s the answer to virtually every question where Hollywood is concerned — is money. Studios have latched onto the premium price of 3D ticket sales as a crucial income stream, and re-releases are an easy way to squeeze a few extra bucks out of a pre-existing property. Sometimes there’s also an additional promotional component involved. The IMAX Raiders precedes the Sept. 18 release of the Indiana Jones films on Blu-ray; the 3D re-release of Toy Story and Toy Story 2 was a lead-in to Pixar’s Toy Story 3, just as the planned Monsters, Inc. 3D re-release later this year will help tease for next summer’s prequel, Monsters University. There is, of course, the other part of the “why”: Why would audiences even bother to see re-releases? In the age of DVD, when pirated torrents slice into the business of even brand new films, why are folks willing to buy a ticket for something they’ve already seen — and, perhaps just as likely, already own? The answer isn’t just 3D, though certainly that experience continues to be a selling point for some viewers. 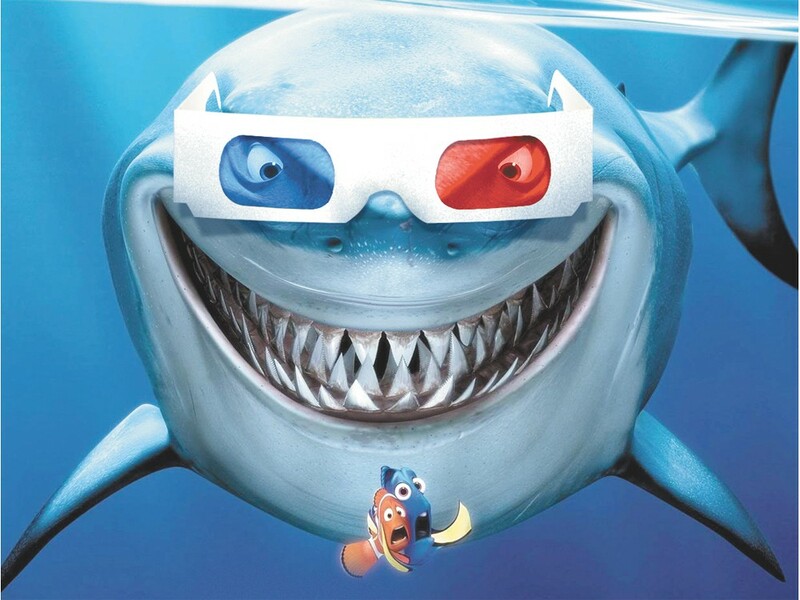 My longstanding antipathy for 3D is no secret, but there are unique visual delights in the 3D version of Finding Nemo. While there may be a few in-your-face effects like a chomp from Bruce the shark, it’s mostly an opportunity to marvel at the detailed, tactile worlds created by Pixar’s animators. Marlin’s individual scales shimmer in the shifting light; Nemo’s fish tank prison in the dentist’s office is adorned with fingerprint smudges; the seagulls chasing Marlin, Dory and their pelican pal plow through a boat’s sail that’s covered in ripples of texture. Every once in a while, such a re-release can turn an old favorite into an entirely new experience. But, just as often, it’s about the opposite: recapturing an old experience. Before the advent of home video, Disney re-released its animated “classics” every seven years or so, allowing a new generation of parents to introduce their children to their own childhood favorites. Yes, it’s nostalgia — but it’s also something slightly more complex. It’s a recognition, it seems, that the theatrical experience is still special to us. Forgive me if I sound like George Will gushing about the purity of baseball, but we go to the movies not just to see a movie; we go also to be at the movies — to wait for the moment when the lights go down, the world is shut out and we allow ourselves to be immersed in a story and share that experience with a crowd. The generation that has grown accustomed to watching movies on computer screens and iPads still goes out to the movies, and not just because it’s something to do with friends on a Friday night. It’s an entirely different way of watching — one that feels grander and more communal. It’s easy to be cynical about seeing a decade-old movie pop up in theaters, as though the 3D might just as well include a hand plunging out of the screen to yank $15 more dollars out of your wallet. But maybe, every once in a while, these re-releases might be a better choice than some mediocre new release. These are, after all, the movies that remind you why you love going to the movies in the first place.